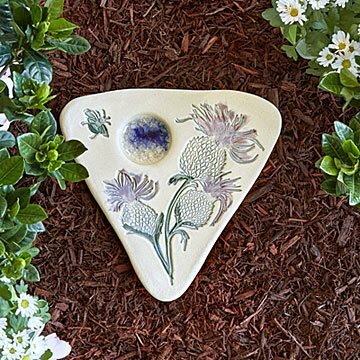 Attract more butterflies to your garden with this stoneware piece that releases minerals they love. It's the little things in life. Fully-bloomed flowers. A butterfly landing on your shirt. Jo-Anne and Gerald Warren's stoneware piece attracts those little lovelies with a superpower: special minerals. The shallow well of recycled glass holds sand or rock salt and a teaspoon of water. When the water evaporates (in under a day), butterflies are attracted to the crystal mixture left behind. Once they know where they can find the delicious treat, they return regularly. Put one in your garden to transform it into an enchanted paradise. Handmade in Canada. Approx. 8.5" L x 8.5" W; 3 lbs. 6 oz. Precisely as described. Excellent craftmanship. This was a very beautiful piece of art! Both my mother and mother-in-law loved it. Unfortunately It is winter here in Wisconsin, so I am excited to see how many butterflies it attracts during the summer.